This Highlands home for sale at 3061 Dillard Road is an updated log cabin boasting long range mountain views. The 2 bedroom, 2.5 bath home sits on a lot that is 10.42 acres in size. The private setting is minutes to Downtown Highlands but feels completely away from it all. 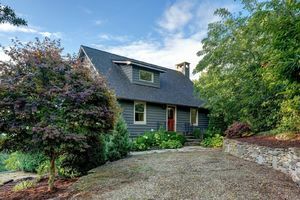 If you have been searching for the perfect mountain retreat this Highlands property should be on your list. This wonderful log cabin is in impeccable condition, completely updated and boasting hardwood floors throughout. The deck is the perfect spot to unwind at the end of the days, offering big mountain views. The galley kitchen is beautiful with granite counters and ample cabinet space. The remodel is stunning and this lovely home can serve as your main house or your guest house once you build your dream home. This large lot has other ideal spots on which to build. Contact our team at Berkshire Hathaway HomeServices Meadows Mountain Realty today to learn more about buying Highlands real estate. We welcome the opportunity to help you conduct a successful property search, locating a home that suits your needs in an area that suits your lifestyle. Let our knowledge and experience serve as your guide, locating the ideal Highlands home for sale for you and your family.